Knead to Relax massage and osteopath clinic in Stirling, is home to an experienced team of therapists qualified in remedial and sports massage, osteopathy, aromatherapy, pregnancy massage and relaxation massage. At our fresh and modern clinic in Stirling, we treat a wide range of conditions and injuries. We now offer safe and effective Hypnotherapy treatments for weight loss, stopping smoking, stress, phobias and panic attacks. What kind of treatment do you need? Neck pain; Shoulder pain; Headaches; Migraines; Upper back pain; Lower back pain; Sore / tight muscles; RSI; Carpal Tunnel; Frozen shoulder; fibromyalgia; chronic or long term conditions. This is a deep massage designed to relieve muscle tension and tightness, alleviate soft tissue restrictions, reduce pain and increase the range of motion in your joints. "I do a lot of Sports"
"I need some advice about how massage fits in with my training. A Sports Massage would be the best option for you. This is a deep massage performed by an experienced sports therapist who can provide advice on how to deal with any muscle or joint problems that are affecting your performance. "I want to see an Osteopath"
"I think something's out of alignment"
"Something went TWANG in my back and I'm in pain!" "I'm really interested in Cranial Osteopathy and would like to try a treatment"
Our qualified and experienced Osteopath Marta Porrini, is the best person for you to see. Treatments involve manual therapy including massage, mobilisation and spinal manipulation as appropriate for each individual patient. If you just want to chill out and be pampered, we have a wonderful range of relaxation massages for you to experience including hot stones massage and our sweetly scented aromatic massage. For a really special treat why not try out our truly indulgent Hawaiian Lomi Lomi massage or Slavic massage. Sore shoulders? Aching lower back? Swollen ankles? Not sleeping well? Why not come in for a pregnancy massage. This specialist side-lying massage will soothe those aching muscles and help you sleep. 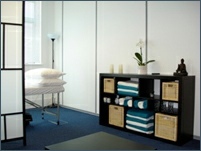 We also offer post-natal massage to get you get your body back on track after your baby is born.